Chief Minister Pema Khandu has directed the Department of Social Justice, Empowerment and Tribal Affairs to draw a foolproof mechanism to avoid delay of releasing scholarship to tribal students. It may be mentioned that on the initiative of Chief Minister, the state government had released a total of Rs. 28.50 Cr from its own sources to the department of SJETA on June 27 last for releasing the pending scholarship of the students in anticipation of funds to be received from the central government. From the money sanctioned to the department, Rs. 19.35 Cr has already been released to the students in their respective accounts. Rest amount is being released simultaneously after following the due procedures. 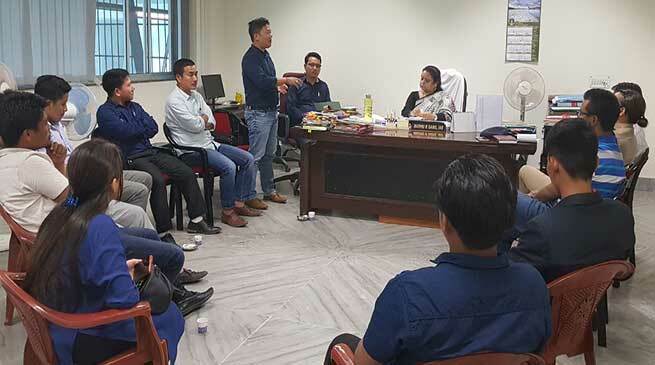 On directives of Chief Minister, Secretary and Director SJETA had a meeting with delegates of All Arunachal Pradesh Students Union and other student’s representatives today. The duo informed the student’s representatives that the Government of India has recently released 40.30 Cr as grant in aid for post metric scholarship to Schedule Tribe Students as arear grant for the year 2016-17. The centre also released another Rs. 2.84 Cr as adhoc grant for the year 2017-18 for the same purpose. The Department made it very clear that due procedure to ensure that there is no duplication in receipt of scholarship must be followed in letter and spirit to which the students body appreciated. The department further appealed that proper documentation should be complied with to ensure that the department is in position to release the scholarship to the students at the earliest possible. Khandu had earlier issued specific directives to the department to immediately release the scholarship to the students. He asked the department to chalk out a well mechanised plan for ensuring that the scholarship/stipend of students are not delayed in future. He meanwhile appealed the students community to make judicious use of the scholarship money for academic pursuit and furthering studies.